attending the seminar check the authenticity of the certificates of those of holy virtue. 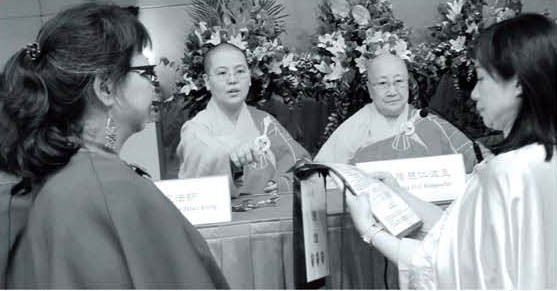 [Dateline: Hong Kong] The largest Buddhist meeting in the world in the year 2010 began on July 17th and successfully ended in the afternoon of July 18th at the Hong Kong Convention and Exhibition Centre. 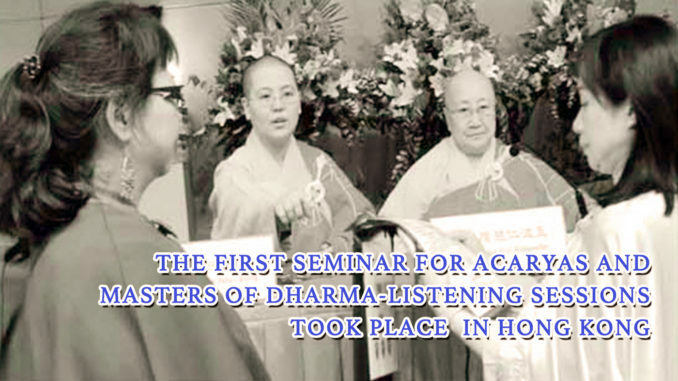 This “Seminar to Exchange the Experiences of Acaryas and Masters of Dharma-Listening Sessions” was held by the International Buddhism Sangha Association headquartered in San Francisco, U.S.A. Its purpose was to study the thoughts of H.H. Dorje Chang Buddha III. People from more than 1,500 Buddhist organizations attended the seminar, such as organizations based in mainland China, Hong Kong, Taiwan, Thailand, Malaysia, Vietnam, United States, Canada, and other countries and regions. The International Buddhism Sangha Association stated that since the audio recordings of dharma discourses given by H.H. Dorje Chang Buddha III were distributed and played all over the world, this trend to learn the theories of those dharma discourses and put them into practice continues to grow unabated. An ever increasing number of Buddhist organizations are applying to the International Buddhism Sangha Association to receive and study the audio recordings of dharma discourses given by H.H. Dorje Chang Budda III. Although the registration deadline to participate in the seminar passed a month and a half ago, many people were still sending out faxes and emails up until the eve of the seminar making urgent requests to participate in it. So many people were ardently intent on attending this seminar. Subjects that were part of the seminar included cultivating oneself, learning Buddhist doctrines and Buddha-dharma, selflessly benefiting others, and other topics. The atmosphere was extremely lively. Numerous people had the opportunity to speak, and the content of the seminar was quite astounding. 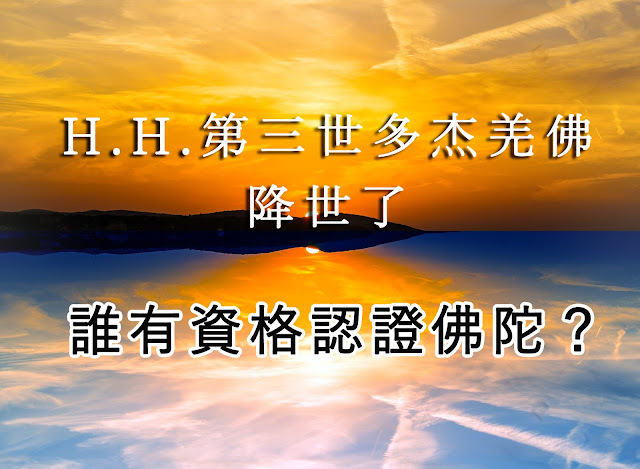 The International Buddhism Sangha Association also announced to everyone at the seminar wonderful news that practitioners of Buddhism were longing to hear: In order to benefit people’s cultivation, the Office of H.H. Dorje Chang Buddha III has formally issued two great mind-essence dharmas on cultivation that are part of The Supreme and Unsurpassable Mahamudra of Liberation. Those dharmas are “Second Preliminary Practice: Xia Man Shu Sheng Hai Xin Sui” and “Third Main Practice: Zui Sheng Bodhi Kong Xing Hai Xin Sui.” This truly is extremely wonderful news for all of humanity. Those two dharmas will bring to humanity and countless living beings happiness, health, complete good fortune, complete wisdom, and worldwide prosperity. During the seminar, rinpoches, dharma teachers, masters of dharma-listening sessions, leaders of Buddhist organizations, and ordinary Buddhists from all over the world related many deeply moving personal learning experiences and true miracles. When anyone spoke of learning the thoughts and cultivation teachings of H.H. Dorje Chang Buddha III, the entire auditorium was filled with an atmosphere of piety and everyone was inspired. One after another person spoke of how their family situation, business, health, relations with neighbors and colleagues, and other aspects of their life quickly improved after they began learning the Buddha-dharma and cultivation methods taught by H.H. Dorje Chang Buddha III and after they started emulating the noble moral character of H.H. Dorje Chang Buddha III. The conclusion of the seminar was that the Buddha-dharma and dharma discourses that H.H. Dorje Chang Buddha III has brought to this world correct the confused and disordered state of affairs that exists in Buddhist circles in this Dharma-Ending Age. It was also concluded that the Buddha-dharma and dharma discourses of H.H. Dorje Chang Buddha III provide people with a correct and overall understanding of Buddhism; that is, Buddhism is based on great compassion and benefits all living beings and that by truly cultivating oneself and learning Buddhism, one brings about happiness in one’s family, success in one’s business, peace in the world, and harmony among mankind. There were three true things at the seminar that were especially astonishing. First, among all of the rinpoches and dharma masters who participated in this seminar, those who are on the level of a holy virtuous one had a Certificate of One of Holy Virtue. Three masters and seven witnesses (all together ten rinpoches, dharma teachers, and acaryas) signed a vow of truth on each of those certificates proving that the holder of the certificate indeed has the realization of one of holy virtue. Those certificates show that the holders of them are not like those false rinpoches and dharma masters in Buddhist circles who deceive people. Those seated on the platform who had a Certificate of One of Holy Virtue were Great Dharma Master Miao Kong, one of the five greatly virtuous ones who realized the Path and Fruit; Dharma Master Lajian Long Hui, Chairperson of the International Buddhism Sangha Association; Venerable Xiangge Qiongwa IV Duozha Xinxiong Rinpoche, President of the Los Angeles Buddhist Academy; Dharma Master Jue Hui, abbess of Sanger Mission and Bodhi Monastery; Zhaxi Zhuoma Rinpoche, President of the Xuanfa Institute; Shudan Zhuma Rinpoche; and Dorje Jueba Longzhou Rinpoche III. After these persons of holy virtue performed rituals, hung their certificates, paid respect to the certificates, and ascended the platform, all of the acaryas, masters of dharma-listening sessions, leaders of organizations, abbots, and abbesses worshipped the Buddhas, paid respect to the certificates, and then one by one ascended the platform, carried out the proper etiquette, and carefully read those certificates in order to verify their authenticity and the level of realization each certificate holder has. This was done in order to be responsible toward living beings and carry out the Buddhist practice of being open and aboveboard. All of these actions, which were highly praised, showed respect for the Buddhas and those of holy virtue and showed a sense of responsibility toward living beings. The second especially astonishing thing was a miracle that happened as a result of ingesting a Kazhuo Ande pill. At the seminar, Shudan Zhuma Rinpoche from Thailand described to everyone the true story of a person by the name of Jack. Jack was injured by a bullet. Because that bullet was stuck amid some blood veins at the back of his kidney, he underwent two major surgeries at a hospital, both of which were unsuccessful in removing the bullet. After Shudan Zhuma Rinpoche learned of his situation, she gave a Kazhuo Ande pill to Jack. The Kazhuo Ande pill was made from the dharma practice of Mozhi Great Rinpoche, who is a disciple of H.H. Dorje Chang Buddha III and who has a Middle Level of Holy Realization Certificate. One week after Jack ingested it, the bullet in his body miraculously moved to his chest area right under his skin. The doctor then used a small surgical knife to cut a small opening in Jack’s skin through which the bullet fell out. A video of Jack personally describing this experience of his was played at the seminar. The third especially astonishing thing was a miracle that happened as a result of respectfully listening to recorded dharma discourses of H.H. Dorje Chang Buddha III. A fourteen-year-old boy from Chongqing, China by the name of Chaopeng Luo came to the seminar. When he was in the last term of the fifth grade of elementary school, he would often feel dizzy and would often have ulcers in his mouth. Since he experienced no improvement through traditional Chinese medicine, in 2009 his mother took him to the Xinan (West South) Hospital in Chongqing and the 301 Hospital in Beijing to have him undergo comprehensive examinations, such as CT scans, etc. After medical experts held a group consultation, they concluded that the carotid artery in the right side of his neck contained a congenital tumor. There is currently only one other example of this in all of China. Surgery could not be used to remove the tumor. Furthermore, the tumor was growing increasingly large. Thus, the life of this boy was in constant danger. Since the right side of the neck of Chaopeng Luo had swollen a great deal, the doctors had no choice but to have him stop attending school so that he could stay at home. Just when the entire family fell into a state of hopelessness, a Buddhist in Chongqing by the name of Zongqiong Zhao happened to meet the grandmother of Chaopeng Luo. Zongqiong Zhao had the grandmother take Chaopeng Luo to listen to recorded dharma discourses given by H.H. Dorje Chang Buddha III. Right after the boy listened to the first CD containing a dharma discourse, he said that his neck became hot. The part of his neck where the tumor was had indeed become red. After he listened to the second CD containing a dharma discourse, the redness on his neck disappeared. It turned out that Chaopeng Luo listened to dharma discourses of H.H. Dorje Chang Buddha III for three straight weeks. Not only did the lump on his neck become smaller and smaller, his energy level and mental outlook became better and better, his appetite increased, and he grew taller. The tumor has now completely disappeared. His entire family is sincerely grateful to H.H. Dorje Chang Buddha III for saving his life. Thus, the young Chaopeng Luo insisted on personally appearing at the seminar so that he could use his own experience to tell everyone that the dharma discourses of H.H. Dorje Chang Buddha III not only teach people to elevate their morality, deepen their cultivation, and benefit others, those discourses also can save people’s lives and bring benefits and happiness to humanity. The host of the seminar confirmed that examples of this kind are quite numerous. Due to limitations on the length of this article, it is not possible relate each and every such example. There were also many people who did not meet the registration deadline to attend but who still sent in letters of their learning experiences describing how after they and others around them learned the Buddha-dharma of H.H. Dorje Chang Buddha III, they experienced various seemingly incredible yet entirely real benefits. Attendees of the seminar said that the experiences related at the seminar are examples of the great benefits H.H. Dorje Chang Buddha III has brought to so many people through His teaching of Buddha-dharma in this world. The attendees also said that such happiness and well-being cannot be found in any other place. They affirmed those incredible yet very much real miracles that occurred right here in the human realm. teachings, and thoughts of H.H. Dorje Chang Buddha III.